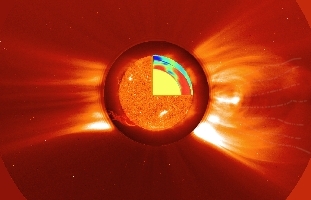 A composite image of the Sun that depicts the range of SOHOs scientific research -- The interior image from MDI illustrates the rivers of plasma discovered flowing under the Suns surface. The surface image was taken with the Extreme ultraviolet Imaging Telescope (EIT) at 304Å. Both were superimposed on a Large Angle Spectroscopic Coronograph (LASCO) C2 image, which blocks the Sun so that it can view the corona in visible. The image suggests the range of SOHO's research from the solar interior, to the surface and corona, and out to the solar wind.